Foot pain is a common complaint that Chiropractors and massage therapists hear in our office. While there are many causes for foot pain, one of the more common diagnoses is plantar fasciitis. Plantar fasciitis has a couple key defining symptoms which include heel pain, improves with rest, and is worse with the first 5 steps after rest. 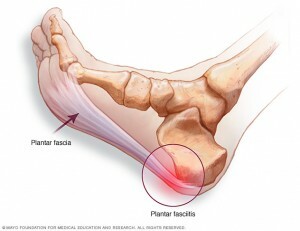 Plantar fasciitis is considered a repetitive microtrauma injury in which the connective tissue on the bottom of the foot undergoes multiple little tears. For decades the common modalities for treatment consisted of stretching, ice, ultrasound, orthotics and rest. While these are still viable options, plantar fasciitis can be difficult to get rid of and tends to linger for prolonged periods of time. This is because it is tough to heal an injury that gets worse with activity and it is virtually impossible to rest for the weeks necessary to heal. Nonetheless, newer research has been looking at Shockwave Therapy to accelerate the healing process of plantar fasciitis. Shockwave Therapy has been shown in research to be the new Gold Standard for eliminating plantar fasciitis pain. For more information about foot pain, Chiropractic Care and Shockwave Therapy, contact Clayton Heights Chiropractic today!